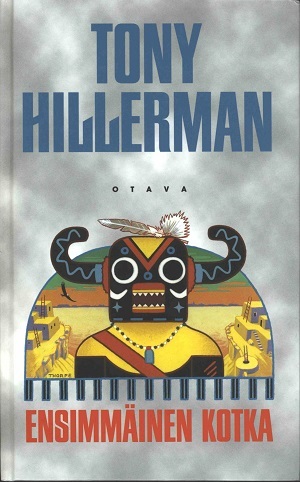 This is the Finnish hardback edition of The First Eagle, the thirteenth Tony Hillerman Navajo Mystery novel featuring Joe Leaphorn and Jim Chee of the Navajo Tribal Police. This edition was published by Otava in Helsinki, Finland in 2000. It is a part of the Crime Club which is the division of Otava that printed crime novels from 1989 till 2008. The text was translated from English to Finnish by Juhana Rossi. Binding: Full color boards with the Crime Club logo printed in red and the title and author's name printed vertically in white on the spine.